If you understand the steps to making basic straight needlepoint stitches, you can use those stitches to needlepoint letters onto your designs. Needlepoint a name onto a shirt or bag, or needlepoint a quotation onto a cross stitch piece. 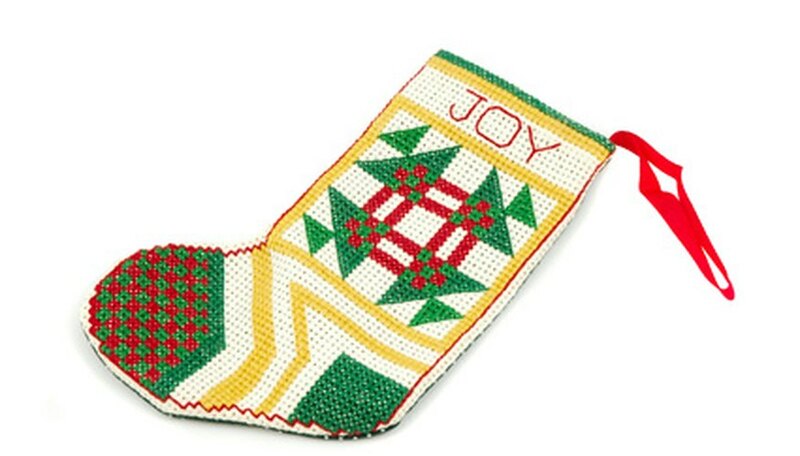 Your needlepoint letters will add the finishing touches to any design. Write out the letters for your wording onto a piece of needlepoint chart paper. If you do not have chart paper you can pencil in the letters directly onto your needlepoint work, but be careful not to make mistakes. If you use chart paper, find the center of your lettering design and match it up with the center of your needlepoint piece; this will be your starting point. Thread two or three strands of embroidery floss onto a needle; the more strands you use the thicker your line will be. Pull the ends of the floss all the way through the needle and knot them together at the ends. Insert your needle into your needlepoint piece, moving from the back to the front. Start at the center of your work or in the lower left corner of one of your letters if you penciled them directly onto the piece. Pull the needle through until the knot is flush with the back of the piece. Make a stitch that is one square long on your needlepoint fabric. Insert the needle from the front to the back of your piece, pulling through all the way. Now pull your needle up two spaces ahead of where you are, from the back to the front. Push it back down in the space in between to finish this stitch. Continue to make single-spaced stitches, some forward and some backward, to finish each letter. Whenever you run low on embroidery floss simply tie a knot in the back of your piece and re-string another thread to start over. If you don't want to freehand draw your letters, trace them from a printed paper onto your embroidery chart or fabric. You can use a pre-made pattern or print your own on your computer.